Looking for dispatch shelving for cardboard boxes? Using a shelving system does not only mean you can maximise your space in the dispatch area it also allows you to use specific shelves for dispatch locations. Certain bays or shelf levels can be reserved for specific locations or dispatch pickups by location, customer or time slots. This can improve the accuracy of your products dispatched and make your dispatch operations faster and more cost effect. 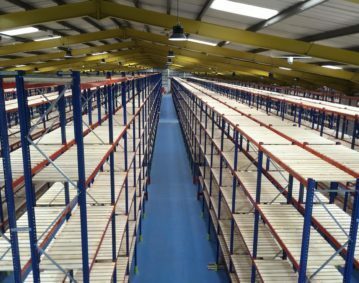 Depending on the type, weight, budget and speed of pick rates we can supply a wide variety of shelving and pallet racking options to help you get your warehouse running to maximum efficiency. We have experience in assisting a wide range of customers from complex multi-product semi automated dispatch and picking systems though to a few bays of cost effective shelving. So whatever you’re shelving needs we offer a full design and technical service with delivery and installation options to suit most budgets from a few hundred pounds to hundreds of thousands pound installations. Longspan shelving is a popular strong and heavy duty shelving system with adjustable levels, which can be finished in chipboard or galvanised steel insert panels. This system looks a lot like and is often described as mini pallet racking as it uses similar looking frames and beams. There are varying heights of frames from 1200mm to 4000mm with the option to clad end frames with mesh or solid panels or leave as open frames. With Longspan beam lengths of 1050, 1200, 1350, 1500, 1650, 1800, 1950, 2100, 2250, 2400, 2550, 2700, 2850, 3000 with the 2400 and 2700mm being some of the more popular. These varying fame heights and beam lengths makes Longspan shelving very flexible with bespoke solutions available from standard parts meaning that the product can be tailored to runs and shelf lengths to suit your needs and building without the cost of bespoke items. Here at 2h Storage we want to make sure that you get the best possible shelving solution for the most cost effective price. Being one of the Norths leading supplier of pallet racking and Longspan shelving allows us to negotiate the best discount prices from manufactures and pass these saving on to you. If you need Longspan shelving for your facility call 2h Storage today and let us arrange to visit site for a FREE survey and measure making sure you get the best products and Longspan shelving to suit your needs and budget. Are you looking for a popular and versatile type of shelving smart enough for retail display and strong enough for garage shelving. In fact here at 2h Storage we can get you any type of shelving you want, from wire shelves, standard garage shelves through to bespoke display shelves. We also offer many discounted and package deals on items like shelving with plastic bin storage or shelf trays. We carry a full range of plastic bins, plastic boxes, plastic shelf trays, plastic Euro boxes, nesting plastic boxes, stackable plastic boxes and plastic pallets. Some of the shelving products we offer are Longspan shelving, industrial shelving, work shelving, office shelving, metal clad shelving, rack shelving, wire shelf racks, galvanized shelving, parts shelving, box shelving and many more. We offer FREE DELIVERY nationwide on many of our shelving products with NEXT DAY delivery options. Wire shelves and racks are one of our most popular items shelving items, this is a versatile, stylist and robust product. You can get a wide range of sizes and options to store lots of items, with garment / coat hanging, wine rack shelves, flat, basket and half-moon this versatile product has many uses. Due to it being easy clean and well ventilated it is popular in kitchens and food preparation areas. With laundry and garment storage options hotels and health spas are regular buyers. Popular with shops, retail outlets and other stores its stylist and versatile as display and point of sales for a wide range of products. Often when you have multiple warehouse pallet racking bays, Longspan or shelving you need to label locations to allow easy inventory product and stock control. Without clearly labelled bays and levels it is easy for people to pick the wrong stock and cause supply problems further down the supply chain. Here at 2h Storage we have a wide range of label options from simple magnetic labels through to our unique bay and shelf signage frame products ranges only available at 2h Storage. Plastic storage bins and plastic storage boxes are popular items for production and warehouse facilities. They are usually stored on Longspan shelving but are ideal for use on benches or for picking levels on warehouse pallet racking. Here at 2h Storage we can provide a wide range of plastic storage bins and boxes in many colour and size choices to make the perfect combinations for your needs. We can also provide discounts for larger orders and offer free delivery to you. Make things simple and pay by personal or company credit or debit card over the phone. If you have a requirement for the storage of small parts or a variety of products we would be happy for one of our experienced storage and capacity surveyors to call and advise you on the best size, type and combination of plastic storage bins and boxes. We also stock a large range of plastic bin dividers, Longspan and economy shelving, new and used pallet racking right through to Mezzanine Floors. Wire shelves with FREE DELIVERY!! When you are looking for shelving for food preparation or food storage it might be worth considering wire rack shelving. Here at 2h Storage we have supplied many happy customers with the wire rack shelves for use in kitchens and for food storage. They come in a range of attractive finishes that include silver finish and a chrome finish. This versatile and very popular product also has a wide range of other uses including retail display, laundry storage because of its easy clean and added advantage of its natural ventilation. At 2h storage its very important to us that our customers get the best storage and shelving products for their requirements. It is always worth speaking to one of the team to make sure we get you the best value from your shelves, warehouse racks or warehouse supplies. Do you have a copy of our catalogue, we would be happy to supply you one, just give us a call and we can arrange a copy for you. So if its kitchen wire rack shelves or a full high tech pallet racking or warehouse fit out project you require, just give the helpful team here at 2h Storage a call or fill in an enquiry form TODAY!!! Garage shelves are a must have item for you if you are tripping over all the stuff in your garage. Garage shelves help keep the garage tidy and also keep things out of reach of children and pets, we can supply very cost effective heavy duty garage shelves at prices that beat most high street and retail park shops. You can get your garage shelves delivered straight to your door, so no messing about dropping car seats and wasting time and fuel. Garage shelves are great for storing those left over DIY items or your sports, hobby or craft equipment. They will help you keep tools and car cleaning kit in a safe and tidy manner. Our garage shelves come from as little as £69.99 so why not buy clever straight from the distributor and save £££££££! Call 2h Storage today on 01765 640160!